SOLUTION: Picture had sync problem,looking at schematics i could see a 7408@1T was controlling sync output. I used a logic probe and checked the outputs of the ic and discovered one output @ pin 8 was stuck low. Replacing the 7408@1T restored the picture. Replacing the 51516 audio amp restored sound. upwards on Rom B12 on the top board,i corrected the bent leg and re socketed the ic, the sound was restored. If only all CPS boards were this easy! SOLUTION:At first i thought this may be a ram fault,but when i see a dirty game board with surface mount ic`s i find it a good idea to press down on each surface mount chip in turn as the legs can lift on these custom ic`s on occasion. Pressing down on the surface mount custom chip IC84 restored the form of the corrupted foreground characters,viewing ic84 through my light/magnifier showed that pins 107-111 had lifted!. Fluxing the legs and re-flowing the solder at IC84 repaired the fault. SOLUTION:First i replaced all eight 4116 rams with 4164`s with no change,next was the roms but the board used 2516 and 2708`s of which i can replace only the 2516`s with 2716`s (i do not have an programmer that does 2708`s).I decided i had nothing to loose but replace the five 2516`s and hope if there was a rom fault it was one of those and not one of the 2708 roms. I decided i should re-program these roms again one by one just to be certain and sure enough ROM3 had not programmed correctly first time,i burned another and this time when i powered up the board it was fine,just for the record it was ROM4 was causing the game to hang up!.All i had to do was replace the duff 12V bulbs,one behind the D.M.1- coin tag and two behind the fire button. I decided to de-solder the old push/twist type bulb holders with newer push fit bulb holders as they are the most common 12V bulb now,i used 1X 2.2W for DM coin slot tag and 2X 5W for behind the thick plastic fire button. SOLUTION:Blocky garbage did not look like the usual rom/addressing issue you see on other older boards,this board is quite small as arcade boards go and I did not recognize many of the custom cpu`s and there is little i could actually replace so i decided to try my luck with the regular 74 series and noticed quickly that the output of a 7432 @ L9 appeared to be stuck high. This output (pin11) was traced to pin62 of a custom chip IC71 @ 13I.Replacing the 7432 changed nothing and pin 11 was still in high state! But of course in Free Play mode it waits for you to press a button it will not show 'game attraction' (demo mode). 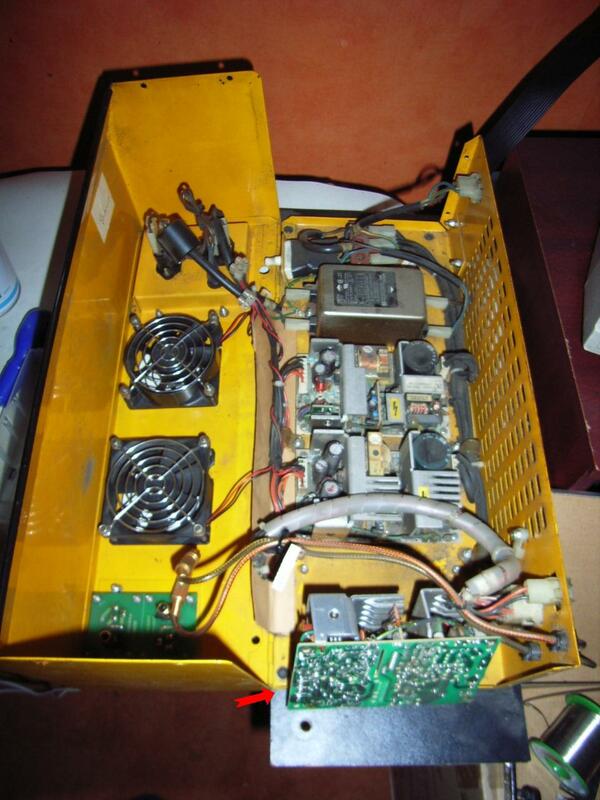 SOLUTION: Cleaned water corrosion on Eproms and replaced a damaged 74L244 on raised daughter pcb game now works. 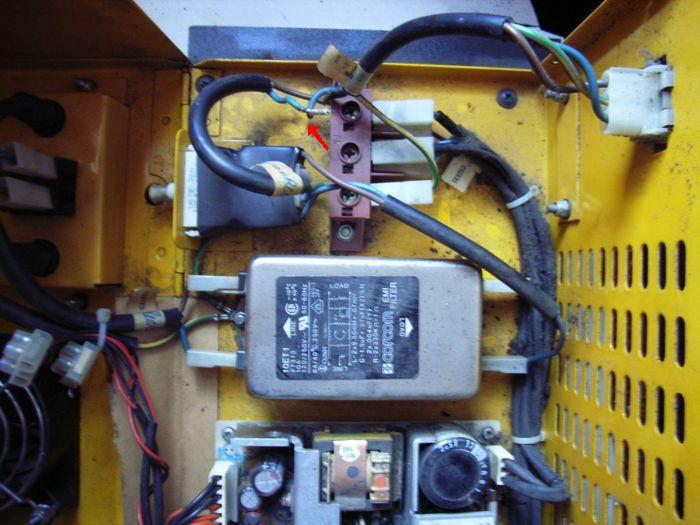 SOLUTION: This cab may of had this problem for a while and in my mind had `bad connection` written all over it!-but the question was where?,i was left with the power supply for a week or so to check it over and i started by opening and cleaning the inside of the unit with an air duster. I re soldered the poor jointing and continued checking the solder side of the other two psu pcbs and the connections and fuse holders top side but could see no other problems. SOLUTION: On seeing o`s i suspected some ROM-data- CPU problem, examination revealed there was NO cpu`s on the board! 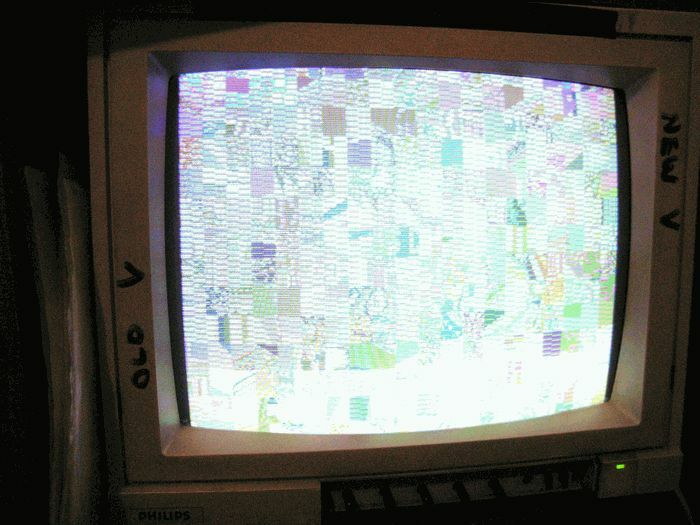 !.Inserted 2X Z80 into the empty sockets and the game sprang to life. But after the game had been running for 1hr the graphics had deteriorated with garbage on title screen,flexing cable connectors changed picture. Re-soldering cable connectors corrected fault. SOLUTION: After looking at board for a short while i decided to power game up WITHOUT sub-board and the game powered up correctly,i presume the small daughter board(sub-board) is to link two cabs/boards together but im not sure. With sub board removed game is fine. SOLUTION: After initial power on the game ran but the all the display was GREEN,pressing board would make the display change colours. 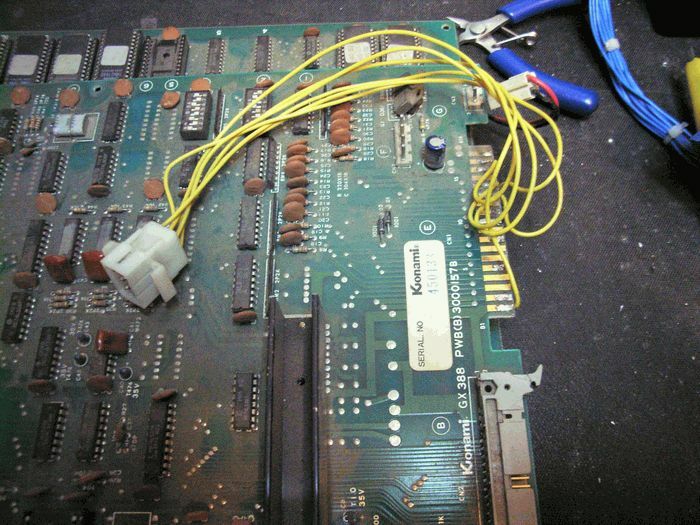 Lifting,cleaning and reseating all socketed chips on the top board restored the game to full working order. LADY BUG (Universal)-----Game powers up to a screen of static garbage and level tone from speaker. 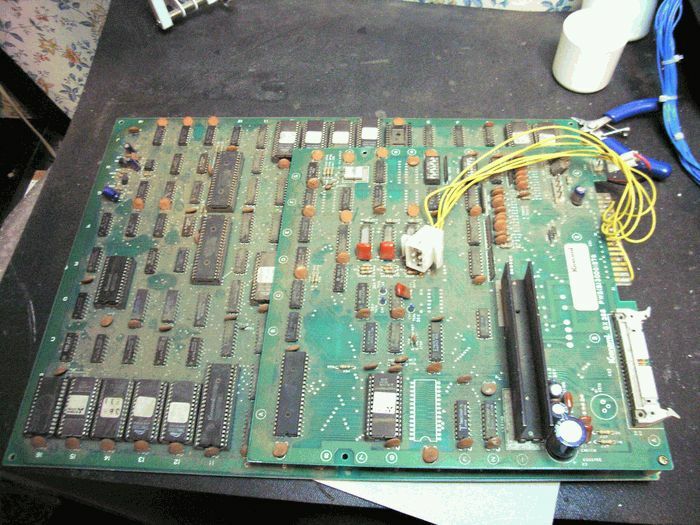 SOLUTION: (1st March 07) When i first obtained this board it had link wire over the reset button on the board but it did work fine and along with Pengo this was one of my favourite games so i was pleased. 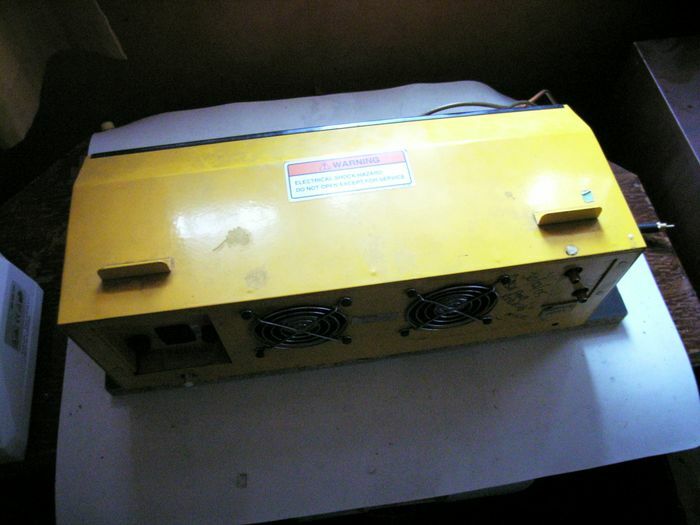 But some time back in 2006 i switched on my cab and was greeted with a static screen of garbage so i removed the board and placed it on the `to-do` pile but now i have finally got around to looking at it. Firstly i checked the z80 CPU it was inactive and the reset was stuck low so looking at the schematics i traced this back through an inverter (working) and then to a 555 timer, pin1 was low (GND) but all other pins were HIGH so i changed the 555 and this resolved the problem. 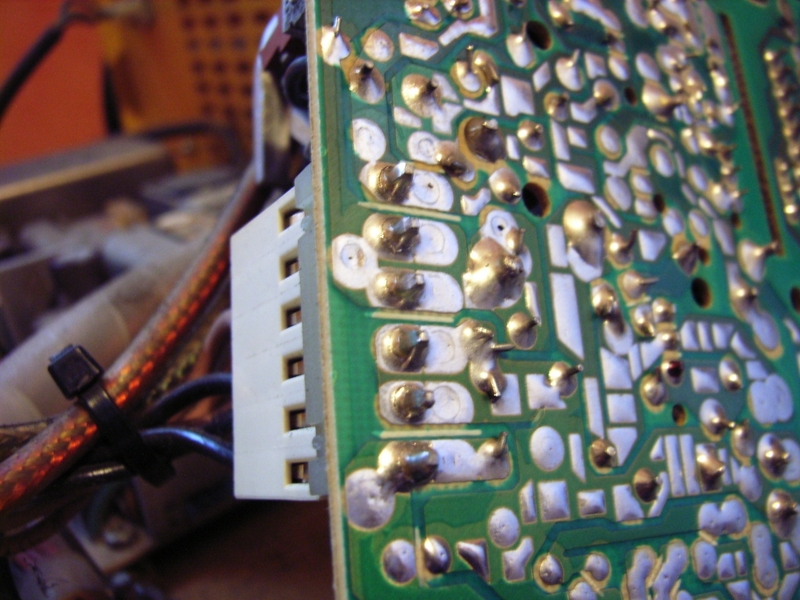 SOLUTION: What follows is probably the luckiest moment of my life,Nemesis was my first board repair. Although i have qualifications in electronics i had not attempted to repair an arcade game board before. I did not even know were to start looking. I decided to choose a side (top/bottom board),then choose one of the four corners of the board to start checking first(so i did).I used reversed lead method of testing i.c`s(positive (red) lead attached to Gnd and testing each I.C leg with negative(black) meter cable-testing reverse bias) i quickly started at the chosen corner and very quickly found an unusual reading, a really low reading from one leg of a 74LS157-(.043 instead of something like .4 or .6).i replaced faulty ic and score is now displayed correctly. I will NEVER be that lucky again with board repair! SOLUTION: Burnt an un-encrypted version of Pengo from MAME and replaced damaged encrypted Z80 with a normal Z80 CPU. SOLUTION:I had taken this board off my work bench to have a look at two boards for Br2000ad (Diet gogo/Time Pilot 84) which i continued to repair within a day of each other! so with those out the way and full of confidence i turned my attention back to Ring King. I have two Ring Kings but this one is on a `Wood Place` pcb which i expected to be the British version (King Of Boxer) so i was quite surprised to see "RING KING" on initial power on. With power on i rubbed my fingers on the underside of the audio amp but there was no buzz or hum from the speakers so my first move was to replace the MB3712 amp with one from a scrap game board. This brought some life to the audio circuit but the sounds were either quite,distorted or just missing all together,i replaced all the caps in the audio (C18,C29,C30,C31) with no change so next i replaced the sound generator @ D5 (AY-3-8910)....still nothing!.Turning the volume pot did adjust the volume but made the usual dirty scratching sound so i decided to replace it as it obviously was not helping and perfect sound was restored. Iwas a little surprised to be honest its easy to think that a volume pot either does or does not work but in this case it was dirty and only partially working. SOLUTION: Obtained another Sky Shark with a faulty Rom,and swapped all the roms from my `dead board`,Self test appeared but stopped with`HW error`.Swapped i.c1C(`CO-1`) and game sprang to life!. SOLUTION: On initial power up the 51516 audio amp smoked, turning off power i noticed the 1000uf cap in circuit was out of shape. (squashed).I replaced the capacitor before reconnecting supply but for time being i disconnected 12V to audio while i checked rest of game first. 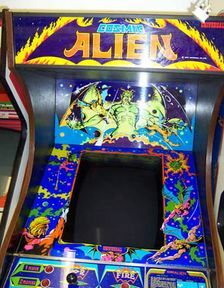 .The game itself ran fine but there were lines through the foreground sprites and some background graphics were just blocks of colour,lifting cleaning and re-seating all socketed chips solved the graphics problem. I reconnected 12V to the supply and then replaced the 51516 amp with one of a scrap game board,this restored sound but it was quiet,increasing the volume just distorted and broke up the sound. (an operational amplifier problem if ever there was one! ).Replacing LM324 (quad op-amp) @ 4B restored normal sound. BOARD 100%! SOLUTION: All voltages fine but there was no logic switching state anywhere on the board,this made me check the crystal which had a pulsing on the output but nothing after it in circuit was switching at all,i pressed the board near the crystal and the game started running!.I simply fluxed and re soldered the connection from the crystal to connecting components including a surface mount ic. For ref i think DIP 4 is test mode. 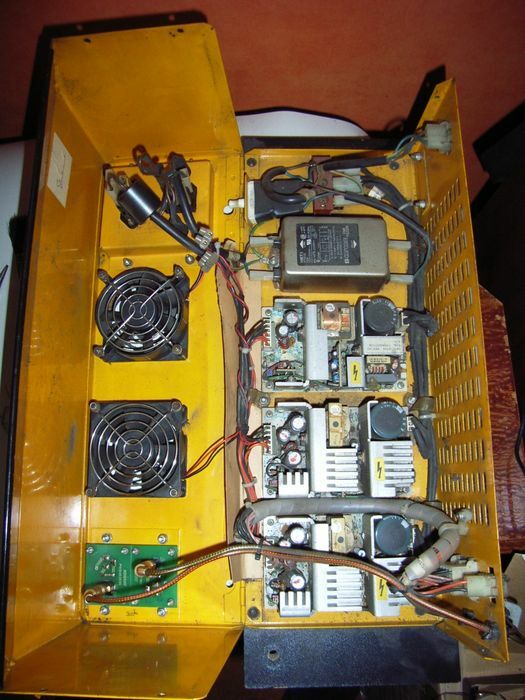 SOLUTION: Obviously a bad connection somewhere at rear of the top board,in the suspect area there are a couple of surface mounts ic`s (I&K 23) and some resistor arrays which look damaged. So first off all i re soldered the damaged resistor arrays but the fault remained- the graphics are still corrupt when the board is moved or flexed. Closer examination suggests the surface mount ic`s are clean and okay so i turned my attention to the near by board connector (CN4).I decided to flux and re-solder the connector ...Bingo! SOLUTION: Replaced missing ic @ A9 (MC68705P5S) with same chip of a scrap tiger heli board. SOLUTION:Firstly i separated the top and bottom boards and after two doses of anti-static foam cleaner and one dose of pcb cleaner the boards were ready to be worked on,next i replaced the missing 1K volume pot with a vertical sub-miniature which was at hand and as for the missing cable for CN2 of all the scrap/faulty boards i own (around 70) the only cable i could find to fit was from off another Konami game `Circus Charlie` which has been on my `under repair` pile for around 2 years. As Charlie has obviously been a naughty clown i decided to borrow his board connector and if Timepilot 84 worked fully Charlie would have to sacrifice it. I re-seated and checked all the socketed ic`s but with the exception of one or two custom chips they were surprisingly clean. Finally i removed the molex connector which had been mysteriously soldered to the edge connector and using solder braid removed the blobs of solder the best i could form the connector pins. The board fired straight up,it was a little touchy near the connector so after further cleaning and a 3 hour bench test i declared it working. 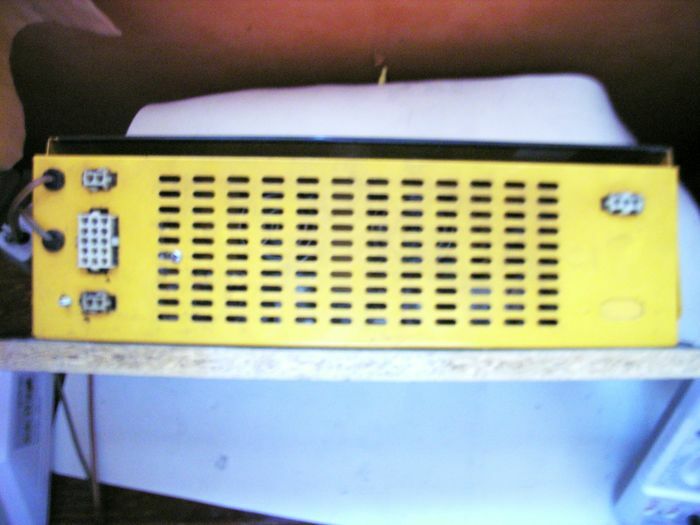 Now the reason for the molex was that Time Pilot 84 is what i call `OLD VERTICAL`in a standard Jamma cab to switch your monitor orientation from 'Horizontal' to 'Vertical' you simply turn the monitor 90 degrees but the game would be upside down and it has no option to `Flip` the display. 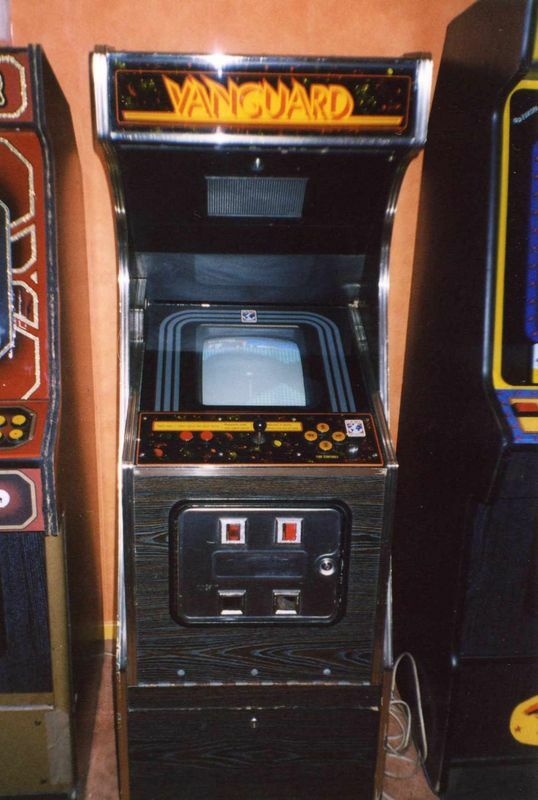 I have known this with other games such as Bomb Jack and Mr Do,so i would imagine there is a chance this Time pilot 84 had been connected to a dedicated old cab belonging to another game. SOLUTION: Two IC legs touching (pin 38 Taito IC J1-pin 8 Taito IC H1),removed short game works fine. SOLUTION: 1./ (Sound:) I removed game board from the cabaret and replaced all electrolytic caps in the audio circuit but the problem remained,so i powered up the board on my work bench and produced my test 2" speaker with probes attached ,i then followed the clean audio to the inputs of a LM3900 (ic37),testing the outputs revealed the hiss! 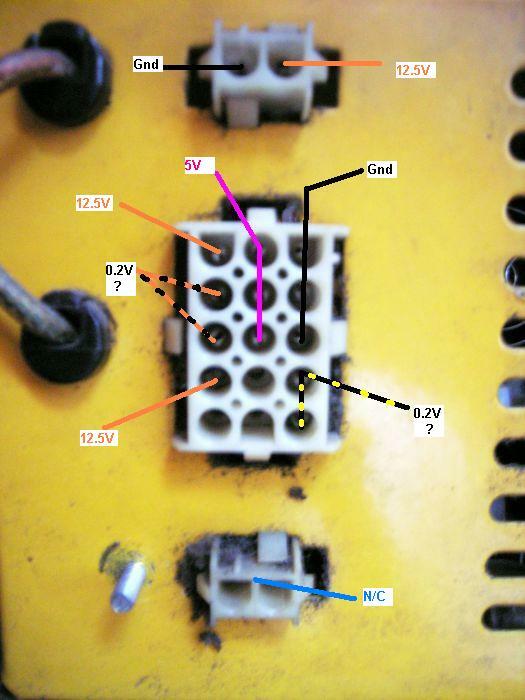 on output pins 4+9.But changing this LM3900 OP-AMP ic did not solve the problem,so referring back to the schematics i noticed that the outputs from another OP-AMP (LM324) were also connected to the outputs of the LM3900,changing the LM324 (ic46) solved the audio problem. I noticed something quite important at this time,on my test rig the graphics had not broken up over time as they did in the cab!,this suggested a PSU problem in the cabaret. SOLUTION: Replaced broken resistor(R113) sound restored. SOLUTION: Original complaint was of stripes on video but if the cart was shaken sometimes the video would be corrected. Re soldered bad joints Pins 21+22 on both ic C4/C2 game soak tested for several hours now works fine.